Also known as the Leguminosae or Pea family, the Fabaceae is the third largest flowering plant family in the World with around 18,000 species, and of massive economic as well as botanical importance for the myriad species of edible legume utilised the World over (see Fabulous Fabaceous Facts below!). Ovary superior and fruit is a pod (the principal unifying feature of the family) usually several seeded and dehiscent and modified in many ways to facilitate dispersal by animals, wind and water. 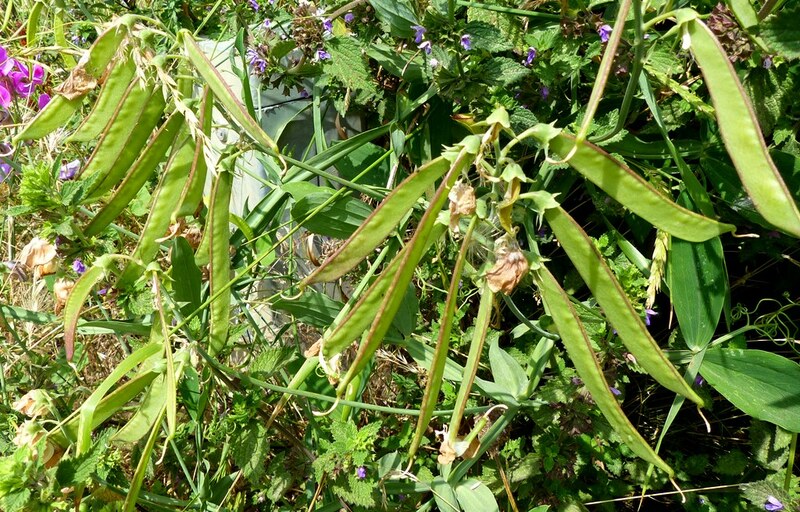 The vetchlings, Lathyrus species, are similar to the true vetches, Vicia species, both genera having pinnate leaves and the terminal leaflet absent or replaced by tendrils. 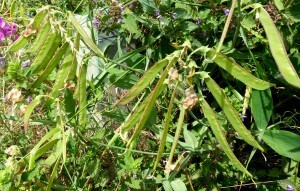 Key differences are the vetchlings have fewer leaflets – sometimes just one pair as in Lathyrus latifolius illustrated here, and often winged stems. In Lathyrus species the styles are hairy on the upper side only, like a toothbrush (whereas Vicia has styles hairy all round, like a bottle brush, check it out!). 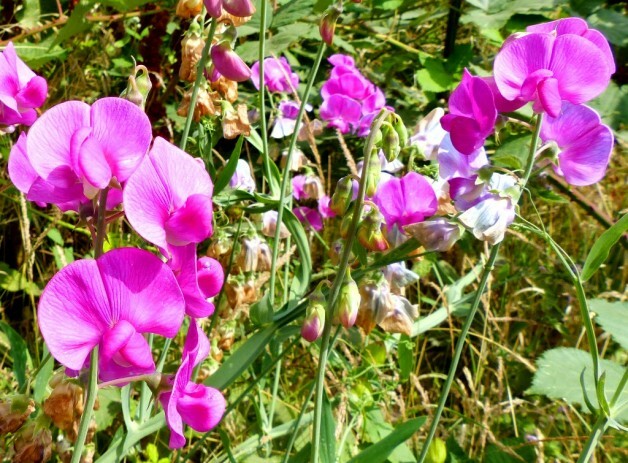 Lathyrus latifolia is not native in Britain, but commonly and robustly naturalised on waste ground and with large, spectacularly Fabaceous magenta-pink pea-flowers, 15-30 mm long and grouped 5-15 together on a long stalk and equally large pea pods. Fabulous Fabaceous fact 1: Many Legumes are able to convert atmospheric nitrogen into nitrogenous compounds useful to plants by the presence of root nodules (visible to the naked eye) containing bacteria of the genus Rhizobium. These bacteria have a symbiotic relationship with Legumes, fixing free nitrogen for the plants. In return legumes supply the bacteria with a source of fixed carbon produced by photosynthesis. This enables many Legumes to survive and compete effectively in nitrogen poor conditions. Fabulous Fabaceous fact 2: Economically, the Fabaceae is the most important family in the Dicotyledonae (Harborne, 1994). Legumes are second only to the Grasses (cereals) in providing food crops for world agriculture. In comparison to cereal grains, the seeds of Legumes are rich in quality protein, providing a highly nutritional food resource. The major staple foods (see 3 below) are all legumes. The total world value for leguminous crops is approximately $US two billion per year. Many more legumes are local food plants. Fabulous Fabaceous fact 3: The sub-family Papilionoideae contains most of the important leguminous crop species such as the Soya Bean (Glycine max), Common Pea (Pisum sativum), Chickpea (Cicer arietinum), French Bean (Phaseolus vulgaris), Lentil (Lens culinaris) and Peanut (Arachis hypogaea). Fabulous Fabaceous fact 3: In addition to food legumes many other legumes yield important fodders, green manures and forages, e.g. Lupinus (Lupin), Medicago (Alfalfa) and Trifolium (Clover). Fabulous Fabaceous fact 4: Legumes are utilised for a variety of other purposes including timber, medicine, tannins and gums. Various species of Lonchocarpus and Derris are the source of rotenone, which is used as an insecticide, fish poison or molluscicide. Some Legume trees yield valuable resins, used in varnishes, paints and lacquers, e.g. Copaifera and others are the source of dyes, e.g. Indigofera which is cultivated for a blue dye – of blue jeans fame! Fabulous Fabaceous fact 5: The economic importance of the family is likely to increase as human pressure places greater demand on marginal land. Many Legume species are characteristic of open and disturbed places and are thus well adapted to grow under poor conditions (because of their rhizobial symbiosis! ).